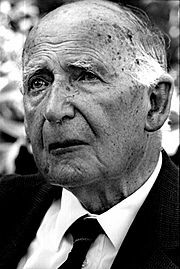 Sir Alfred Charles Bernard Lovell, OBE, FRS (31 August 1913 – 6 August 2012) was an English physicist and radio astronomer. He was the first Director of Jodrell Bank Observatory, from 1945 until 1980. Lovell is mostly known for his works in astronomy. Lovell was knighted in 1961, later becoming "Sir". Lovell was born on August 31, 1913 in Oldland Common, Bristol, England to Gilbert and to Luara Lovell. Lovell was educated at King's Oak Academy. Lovell was never married and had no children. Lovell died on August 6, 2012 in Swettenham, Cheshire, England from natural causes, he was just 25 days short from his 99th birthday, he was 98 years old. Bernard Lovell Facts for Kids. Kiddle Encyclopedia.